This headphone set gives great bass sound with definition and clarity. The comfortable earpieces make it easy to wear for long periods. The headband is not too tight, adding to comfort. The bass almost always cuts out the mid and treble ranges of these headphones. The wired nature of the headphones can get in the way of serious Disk Jockeys. This is a headphone built solely with the aim of providing a great headphone for Disk Jockeys in mind. As such, the headphones provide great bass that can really blow you away. The bass thump on this piece of equipment is truly a revelation. Another great feature is the level of comfort provided by the headphones, allowing you to wear them for hours on end. The Sennheiser HD 212 is a headphone set which has been built specifically for Disk Jockeys. Obviously, DJ s are always concerned with the level of sound quality provided by their equipment. Hence, the Sennheiser HD 212 focuses on providing just that. The sleek black design of the Sennheiser HD 212 provides Disk Jockeys with the level of style they need to keep up their appearance as cool music making machines. The smooth headband and large ear cups keep in with this design. Sennheiser has not compromised comfort for the sake of maintaining a stylish look; the Sennheiser HD 212 is extremely comfortable and can be worn for long periods at a stretch without feeling any pain, a definite plus for Disk Jockeys who are required to keep it going for long periods at all-night parties. As a DJ headphone set, the Sennheiser HD 212 is focused on providing the best sound quality possible. This is accentuated by a heavy bass thump that Disk Jockeys are always looking for. When wearing these headphones, DJ s should have no trouble maintaining a steady beat using their equipment. Thanks to the large ear cups of the Sennheiser HD 212, you can be assured that there will be a level of noise-cancellation automatically provided. This beats having to have batteries in your headphones and having annoying switches to turn noise-cancellation features on and off. The Sennheiser HD 212 is a great buy for the discerning Disk Jockey who really wants to please the crowd, and themselves in the process. These headphones are more affordable than contemporary models. They provide great sound quality with clear treble and bass. Detachable ear pieces enable extended comfort based on your preferences. These headphones are a bit bulky and can be heavy to wear after a while. The earpieces tend to wear down and tear with extended use. 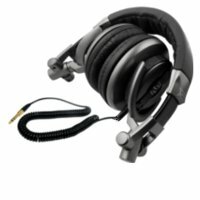 This headphone set provides great sound quality for users who are interested in getting the best audio quality possible out of their audio equipment. The massive earpieces completely cover your ears and their soft cushioning ensures comfort for extended wearing. Since the earpieces can be detached, you can wear them DJ-style as well. Sennheiser has built up a legendary reputation as a builder of high-quality headphones, and the Sennheiser HD 202 is no exception to this rule. The Sennheiser HD 202 headphones are designed as a low-budget set of headphones which means that a certain level of compromise has been made in terms of comfort and durability. The massive earpiece cups are cushioned using faux-leather lined pads, and cover the ears of the user completely, ensuring a level of noise-cancellation. However, this material is prone to become tattered and torn in a short while if you keep using the Sennheiser HD 202 frequently. The Sennheiser HD 202 headphone's earpieces rest on rails rather than on ball sockets, which means that they are fully detachable. 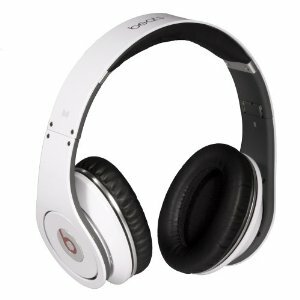 This enables you to make use of them as a pair of DJ headphones, should the need arise. This is quite a feature to get at such a bargain price. The most important fact that should be mentioned about the Sennheiser HD 202 is its awesome sound quality. Sennheiser have gone to great lengths not to compromise the sound quality of these headphones despite the price. Sound is great across all bands, with great bass and treble augmenting the mid ranges. In conclusion, although it may have some issues with comfort and durability, the Sennheiser HD 202 is a great headphone set that could really provide you with great audio quality without leaving a hole in your pocket. Not the cheapest on the block but you do get what you pay for. Nice spectrum. A very good mix of everything. Out of the box this item did take a little to get used to but we warmed up after a week of use. I have a small head compared to most males. The smallest setting fit me but if you have a larger then normal head they should still fit but you may have added pressure. Nothing too fancy. I would not pay the 300 retail price for these but if you can score them for under 200 It's a recommend buy. This item is comfortable and can work great with an MP3 player at the gym. They stay in place. While running around these bad boys stay in place. We have tested out many different Sennheiser headphones in the past and most of the time have more good things to say then bad. For an active person moving around a lot this puppy held it's own. They stay in place while jumping and running around. You can easily wear these to the gym . The 2 year manufacturer warranty doesn't hurt either. It would be nice if they were noise cancelling but they are not. If you were them around the office you would be jut fine but on a bus they just aren't enough to drown out the rest of the world. You have many choices out there on were to purchase. We do like HeadRoom. A good return policy and free shipping on orders over 50 bucks. I adore these DJ headphones! They're the most fantastic headphones for those who like to spin. The laying of sound is magnificent and once you've tried these you'll easily throw away your old pair. They make the job so much more fun! Bad? What bad? With all of the great features and the amazing sound you can't go wrong with these DJ headphones. Love them love them love them! These are the best DJ headphones I've seen so far. The sound is spectacular with clean and clear high tones and deep and rich low ones. You can't go wrong with these headphones. The sound is spectacular with clean and clear high tones and deep and rich low ones. You can't go wrong with these. They're the best DJ headphones I've heard so far. 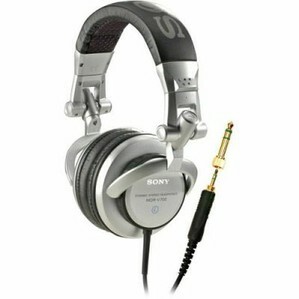 The Sony MDR-V700DJs are high priced headphones that really deliver. It’s difficult reviewing headphones sometimes, because your expectations tend to diminish over time. When it comes to headphones, it's often hard to hear tracks as the artist intended them to be heard because headphones generally don’t offer the same level of tonal clarity and mix separation available on regular speakers. I'm very happy to report that the Sony MDR-V700DJ headphones not only exceeded my expectations, but set a new standard in midrange headphone solutions. The design of these headphones is rugged yet stylish. You'll have no problems tossing these in your bag when you're traveling from gig to gig. If they can survive in my overcrowded backpack on a full subway train they can survive anything. The fold-up construction adds to the durability and portability of the headphones. Headphones can be awkward to travel with and are often prone to breaking in a crowded bag. Neither of these are a concern with the Sony MDR-V700DJ. 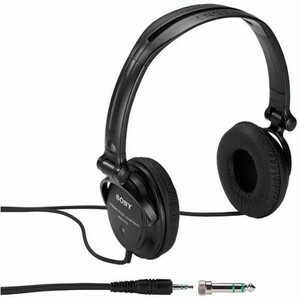 There are a few features about the construction of the Sony MDR-V700DJ that particularly appealed to me. The padded headband was comfortable, not overly cushy. It provided just the right amount of support. The 10-foot coiled cord solves the problem of what to do with those extra long headphone cords. Personally, I'm a fan of the extra long headphone cords, but I understand people's frustration when dealing with all the excess. By coiling their cord, Sony effectively solves this problem. 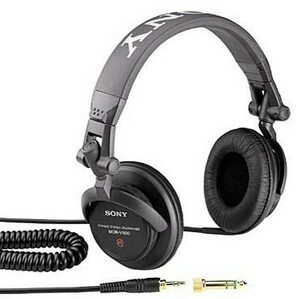 Of course, what really matters is the sound reproduction; and I am pleased to say that the Sony MDR-V700DJ’s have some of the most beautiful and accurate sound reproduction qualities that I have ever heard from headphones. I'm mostly a hip-hop listener, so I fully appreciated the rich and clear bass. More impressive was the headphones' ability to properly layer all the different sounds without sounding muddy. The highs punched through right where they should, and the bass provided rich undertones. No matter how you look at it, if you can afford these DJ headphones, you should definitely buy a pair. They are priced comparably to other headphones in their class, but provide an audio experience that's far more superior.